Cellulite is the troublesome dimpling that so many women have, usually on their thighs and buttocks, but sometimes also on their abdomen or waist. Various creams and non-surgical treatments have been touted as beneficial, but most women have been disappointed with these too-good-to-be-true treatments. Some non-surgical treatments do have some effect, but the effect on cellulite is usually temporary or needs to be maintained with frequent ongoing treatments which can be time consuming, uncomfortable, and expensive in the long run. 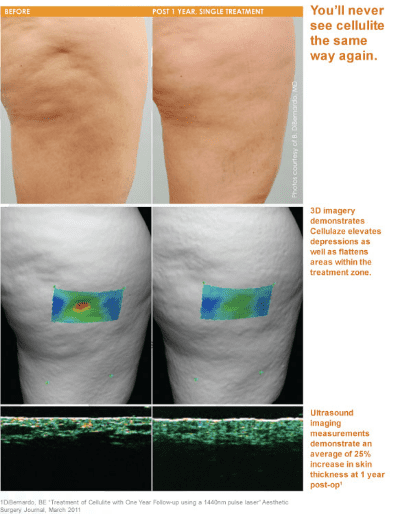 Cellulaze is a minimally invasive laser treatment that has impressive clinical results and a high patient satisfaction rate for improvement of a problem whose previous treatment options have had inconsistent clinical results and poor patient satisfaction. Cellulaze is FDA approved for cellulite treatment and is now available in Santa Barbara with Dr. Douglas Mackenzie. Unlike many non-invasive treatments for cellulite, the Cellulaze procedure usually only needs to be done once. It can be done under local anesthesia, and depending on the area(s) treated, can be performed in as little as an hour. Bruising and swelling can be expected, and results will vary depending on age, degree of cellulite dimpling, amount of excess fat, etc. Not every patient with cellulite will be a candidate for the procedure. Skin care is integral to getting the best aesthetic result after surgery; see our page on products that we include in your Cellulaze package HERE. Find out if you might be a candidate for Cellulaze treatment of your cellulite. Call our office to schedule your consultation with Dr. Mackenzie today.